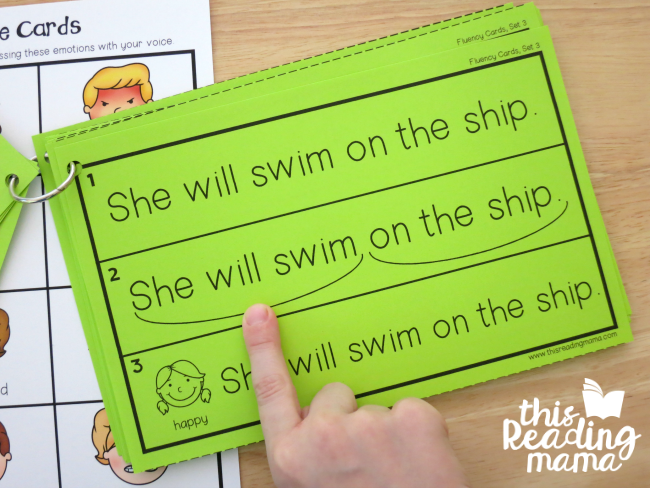 These fluency cards for K-2 learners pack a punch for teaching reading fluency! With this multi-sensory technique, you’re sure to see even struggling readers become more fluent readers! 1- word recognition, 2- decoding, 3- phrasing, or 4- expression. These simple fluency cards can help with ALL four areas! Included in this pack are 5 different levels of fluency cards for K-2 learners. Not only do you have sets 1-5 with the scooping lines, all five sets are included without scooping lines so that you or your learner can draw their own! 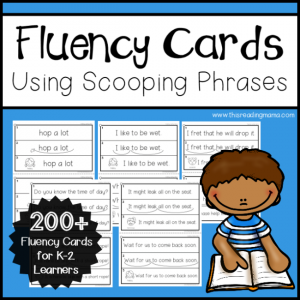 That’s over 200 fluency cards for K-2 learners! Woohoo! Want to know how they work? Here’s a step-by-step! 1. Choose the level appropriate for your learner based on the phonics skills and sight words. Hint: It’s better to choose a level that’s too easy than a level that’s too difficult for fluency practice. 2. On the top line, the learner simply reads/says the words. This is his first practice through and is used to make sure he knows how to read all the words. If your learner doesn’t know a word, help him figure it out or tell it to him. Line 1 helps the reader practice word recognition and accuracy. 3. On the 2nd line, the learner traces his finger along the scooping phrase lines under the words. As he scoops, he groups the phrases together. 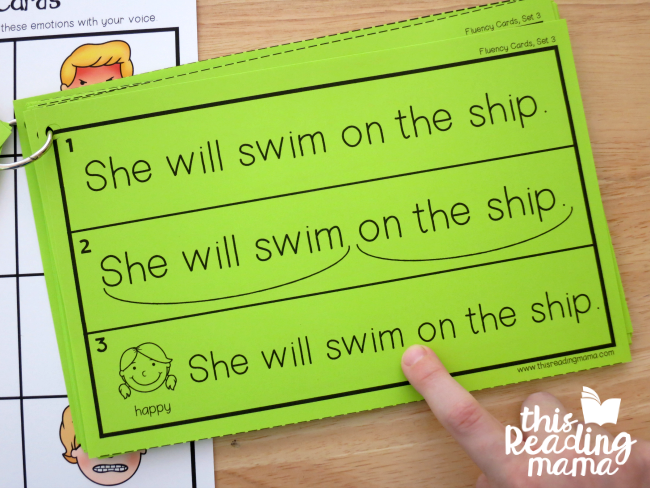 Example: (She will swim)…(on the ship.) A very slight pause goes in between the word swim and on. Blank fluency cards are included if you choose to scoop the phrases in a different way. 4. On the 3rd line, the learner thinks about expressing emotion and phrasing. Using the picture, the learner combines emotion and phrasing to read the sentence again. The learner may choose to still use scooping phrases with his finger or go without. If a learner has trouble with this, practice expressing various emotions using the emotions chart or model it first. If you want to read more about scooping phrases, be sure to visit my post, Improve Reading Fluency & Phrasing with Scooping Phrases.